Opening text strangely describes the story and theme we're about to see absolving the viewer of arriving at his or her own analysis. While manipulative and a bit of a cheat it engages the viewer to pay attention and anticipate the unconventional film we're about to see. The credit sequence featuring classical orchestral music is a bold stroke of fancy in an otherwise unstated and quiet film. We can't help think of Stanley Kubrick's affinity for this method, in particular Barry Lyndon, which may have been an influence. We can also connect Bresson's stripped down performances from his actors who consciously refuse to emote and in fact, play most scenes with little more than a straight face. The rhythm of the picture through editing as this austere performance creates a kind of hypnotic trance which subtly draws us into both filmmakers' worlds. A supremely tense opening sequence puts into the viewpoint of the character. We first see Michel at the racetrack scoping out his next intended victim. The slow methodical actions of opening up a woman's purse is thrilling. Bresson's hero played by Martin La Salle, a non-actor plucked from obscurity and placed under the uncompromising lens of the camera, reminds us of the fresh freshfaced Lamberto Maggiorani from De Sica's The Bicycle Thieves. Through their naive and unemotive performances both directors let the innate humanity etched on their faces create sympathy for their characters. And so, even though Michel is committing a heinous criminal act, even though we don't know who he is, somehow we desperately don't want him to get caught. 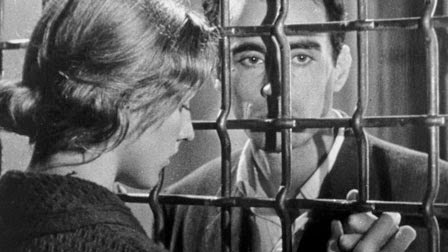 Bresson follows Michel over the course of a couple of years as he educates himself into the world of Parisian thieves and pickpockets. The act of pickpocketing is perhaps the most intimate and thus risky form of theft. Part slight of hand magician, part surgeon Michel must have a calm and steady hand at all times in order to ply his trade. Thus Bresson's careful and simple cinematic philosophy matches up so well to Michel's character. In many ways we can't help but see a reflection of Bresson himself in Michel's desire to master the art. Despite the stripped out emotions of Michel's character there's a supremely sympathetic and humane theme at core. As much as we want Michel to succeed in his thefts, we want him out of the racket and reconcile with his dying mother who waits longing for his son's visits. His symbiotic relationship with the police detective who tails him is one of mutual respect and admiration as opposed to Hollywood cat and mouse tactics. And the near tragic love affair with his neighbour Jeanne plays out as achingly platonic until the riveting finale moments of emotional catharsis. The handsome Criterion Collection Blu-Ray has the usual robust special features, specifically Paul Shrader's astute analysis and articulate of influence on his own pictures.